The state Assembly has approved a bill that would give parents a tax rebate and offer a limited sales tax holiday. State Representative Peter Barca (D-Kenosha) and other Democrats described it as an election year gimmick though, since payments would go out this summer. 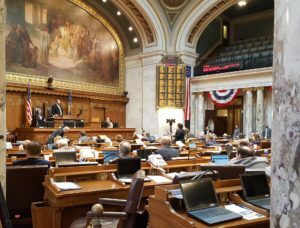 “It reeks of vote-buying and game-playing,” he argued during debate on the Assembly floor Thursday. After nearly three hours of debate, the bill passed on a bipartisan 61-35 vote. The measure now heads to the state Senate, where its future remains uncertain. Senate Republican Leader Scott Fitzgerald (R-Juneau) has been largely non-committal on whether his chamber will take up the bill when it meets next month for the last time this session. If the Senate were to make changes that require Assembly approval, it could likely kill the bill. Assembly Speaker Robin Vos (R-Rochester) has indicated his chamber has no plans to return this year after it adjourns early Friday morning.